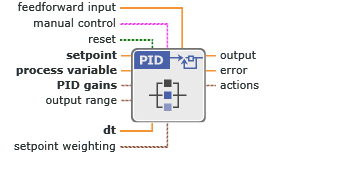 Implements a PID controller in the Parallel form. Proportional gain, integral gain, derivative gain, and filter coefficient parameters of the controller. Integral gain of the controller, in Hz. Derivative gain of the controller, in seconds.